HomeStoriesHeart & HomeWho is St. Patrick? St. Patrick is one of the world’s most popular saints with his feast day, March 17, being celebrated all over the world. Because of the time and place he lived in, 387-461, not much is really known about his life and what is known has been exaggerated over the years to make it hard to remove fact from fiction. One story tells about St. Patrick putting his ash wood walking stick into the ground while he was in the process of evangelizing the Celts. The people who were there took so long to get the point of the lesson that when St. Patrick lett, the stick had taken root! The place is now referred to as Aspatria or the ash of Patrick. One problem St. Patrick had with converting the Celts was that there were very few Christians in Ireland at the time. He had to compete with the pagan religion that was very ingrained throughout the country. He borrowed symbols and rituals from the pagans and brought them into Christianity. He placed the image of the sun behind a cross, an image that is now known as a Celtic cross. St. Patrick used the shamrock to represent the trinity: God, the Father, Jesus Christ the son, and the Holy Spirit. The shamrock already held a high place in Celtic spirituality because of its green color and shape which stood for rebirth and new life. 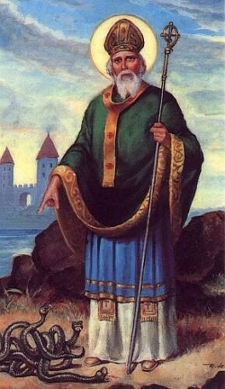 St. Patrick has been credited with banning the snakes from Ireland. There has been research to prove that there were never any snakes in Ireland. Like much of history, myth and legend surround even the smallest facts or ideas. The stories that the Irish have spread about St. Patrick as well as the legends and mystery of this famous era have created a day in which everyone like to feel just a little bit Irish.